It’s cool, it’s arty, and it’s one of the more ‘out there’ design trends. For followers of NASA or Star Trek fans, it’s a meaningful way to liven up a wall. But galaxy wallpaper isn’t for everyone. It’s certainly not the easiest trend to coordinate. So how can we apply a bit of space magic without cramping the style in the rest of the house? We believe there are so many different ways you can make stars, planets and cosmic colours accentuate your home interiors. You just have to know how to harmonise your wall mural with the core elements of your design scheme. To inspire your next project, here are some out-of-this-world room transformation ideas that will appeal to everyone. Galaxy print wallpaper can be an easy way to add instant drama to a minimalist bedroom. 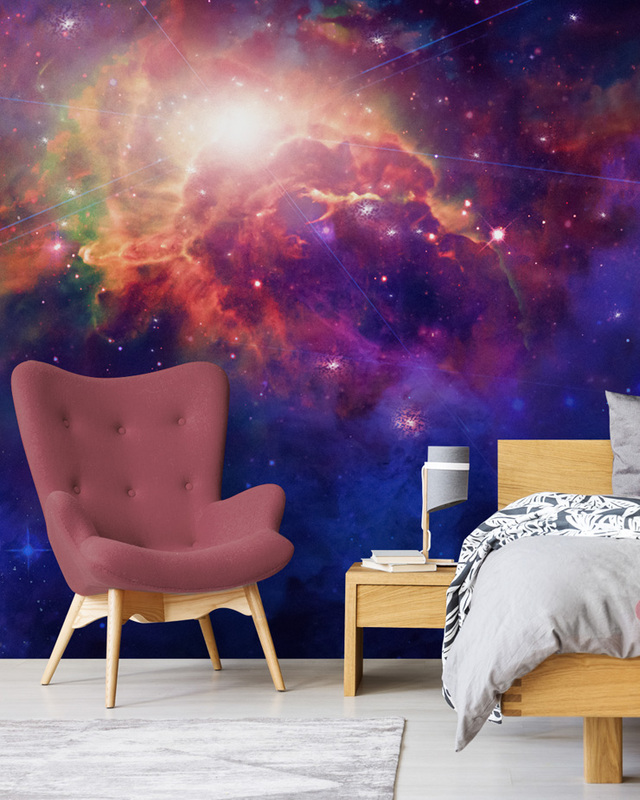 If your guest bedroom or master bedroom is looking a little bare, add a feature wall with this Star-Forming Region LH 95 in the Large Magellanic Cloud mural. It’s even better as a ceiling mural, so you (or your lucky guests) can sleep under the stars. The wallpaper uses official NASA photography captured by the Hubble Space Telescope, giving you a great talking point with anyone who visits your home. To make this mural work, go with simple furnishing options and invest in ample storage to safeguard your room from clutter. Contrasting geometric prints can also add a contemporary finish if you have white walls and floors that are plain enough to play around with. As far as home offices go, they’re usually pretty boring. When it comes to interior design, it can often be an after-thought with other rooms taking priority. But your study doesn’t have to be dull and lacklustre. 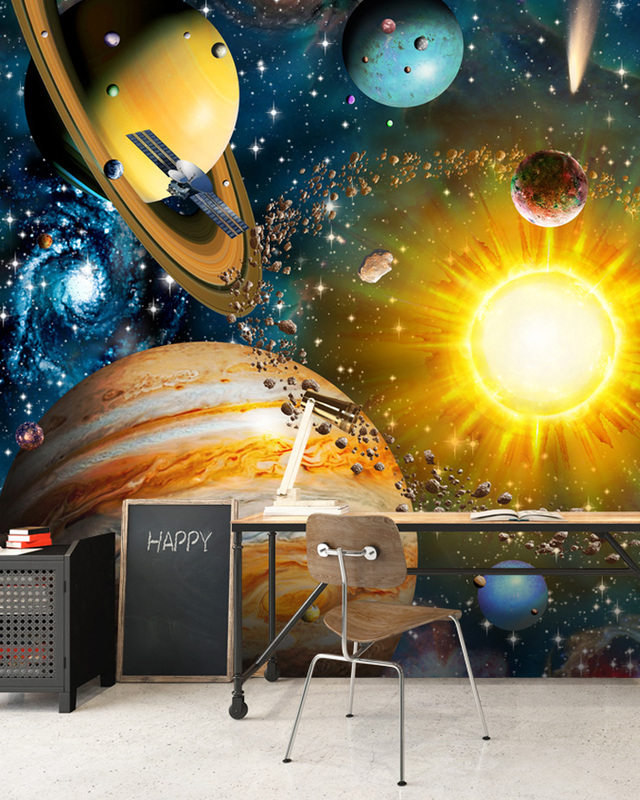 Whether you work from home or need somewhere to double up as a children’s homework room, solar system wallpaper can be such a nice touch. It’s a thought-provoking feature that will inspire and educate at the same time. For kids or adults, it can stir the imagination and even encourage some philosophical thinking. The solar system mural seen here works best in a large and open space. If you’ve got a big wall and you’re unsure of how to decorate it, this space-themed wallpaper is ideal. Use neutral colours and clean lines, and let the planets take centre stage. Is your little one the next Tim Peak? This Hanging Out with Hubble wallpaper is the window into the world of space travel, and works well behind or opposite your child’s bed. Choose a muted colour palette with cool greys and sophisticated black. Or add a pop of something bright, such as a primary colour, to inject some fun to the room. If you want to recreate the feeling of being inside the International Space Station, choose chrome or metal finishes for the bedframe. Industrial-looking storage cabinets are also a great idea and very on-theme. The rest of our NASA photo wallpaper collection uses official NASA photography that can be custom made to any dimension, so you can find something to fit all room sizes. 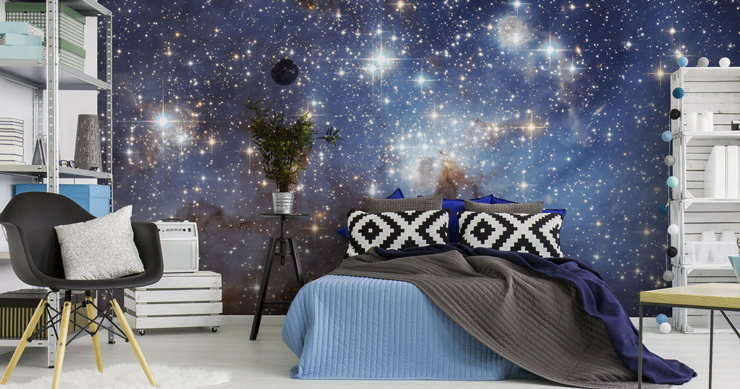 Space wallpaper isn’t just for science nerds and kids bedrooms. In fashion, for instance, galactic prints have been big for a number of years. Anyone who saw Karl Lagerfeld’s space rocket in Paris for Chanel AW17 will know that high altitudes and high fashion go hand-in-hand. 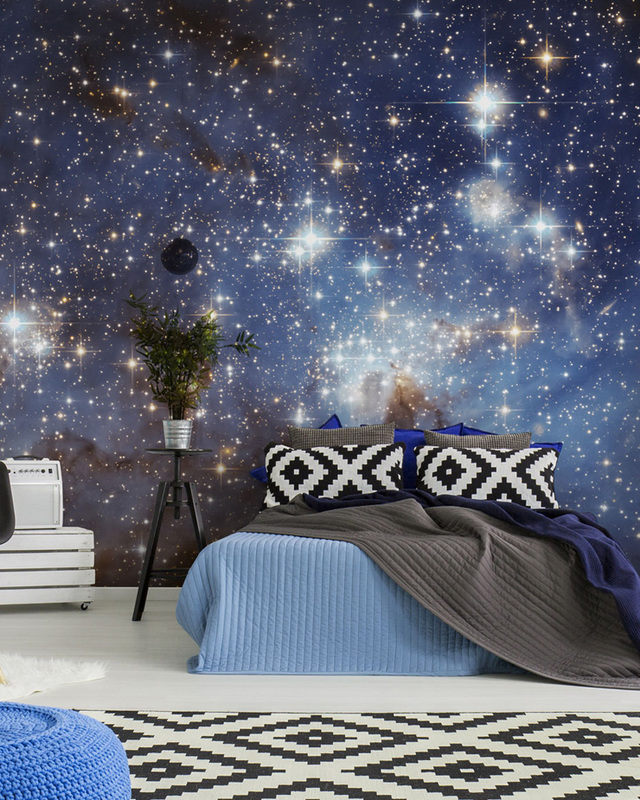 This space wallpaper mural can transform a city apartment or bring joy to a teenage fashionista’s bedroom. Coordinate with retro design and metallic finishes, and buy unusual houseplants (like the Venus Flytrap or a Trachyandra) to bring out your inner alien. If you’ve got an open plan apartment, this stunning moon wallpaper mural is a chic and stylish feature. Not only will it give you a focal point for the room, but it can actually help to make your home appear bigger. 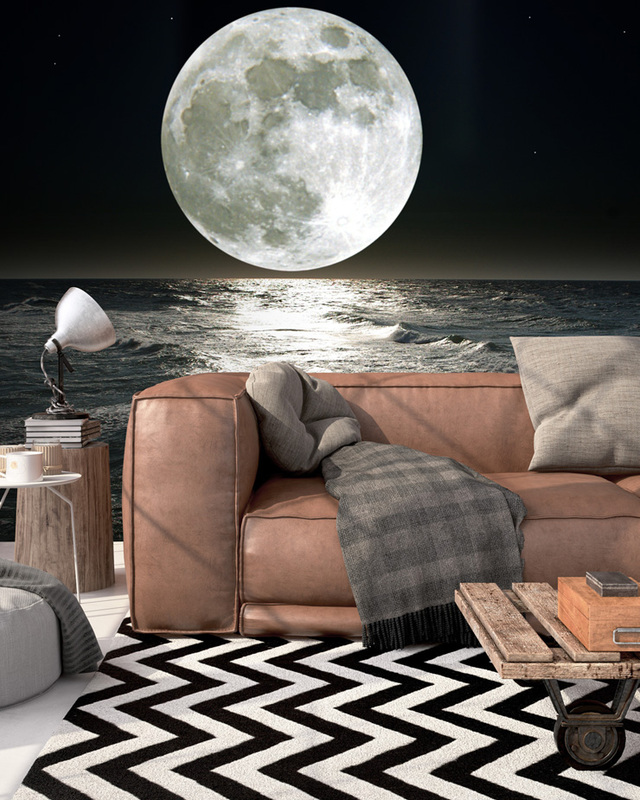 The surreal moonlit ocean can help your living area feel even more open as you look on over the horizon. Finish with sophisticated nudes, creams, greys, blush pinks and deep mauves. And add a touch of monochrome or geo patterns for depth and dimension. Mix different fabrics and textures to give your home that high-end appearance, and hang Scandinavian art prints to keep things modern. Check out the rest of our moon wallpaper range, which features a number of stylish seascapes, as well as some NASA photography wallpaper. If you have second sitting room or a space that hasn’t quite realised it purpose, a cinema can be a wonderful idea. Whilst some might think that a cinema room is rather indulgent, it’s actually very easy to create and can be a fun way to bring the family together. All you need is a comfy seating arrangement, which can be achieved at any budget. Opt for reclining seats if you want to splash the cash, or colourful beanbags if you’re doing it on a shoestring. This Cosmic Necklace Larger Than a Solar System wallpaper is dark enough give you that atmospheric ‘cinema feeling’. For Cosmos / Carl Sagan fans, this is the perfect way to watch the entire series back-to-back. Bring your own popcorn for the ultimate viewing experience. Rocket ship wallpaper is so entertaining for kids. It’s a vibrant way of designing a nursery or play area, without resorting to the typical children’s wallpaper that we see these days. Because not every boy loves trucks and cars, and not every girl loves unicorns. 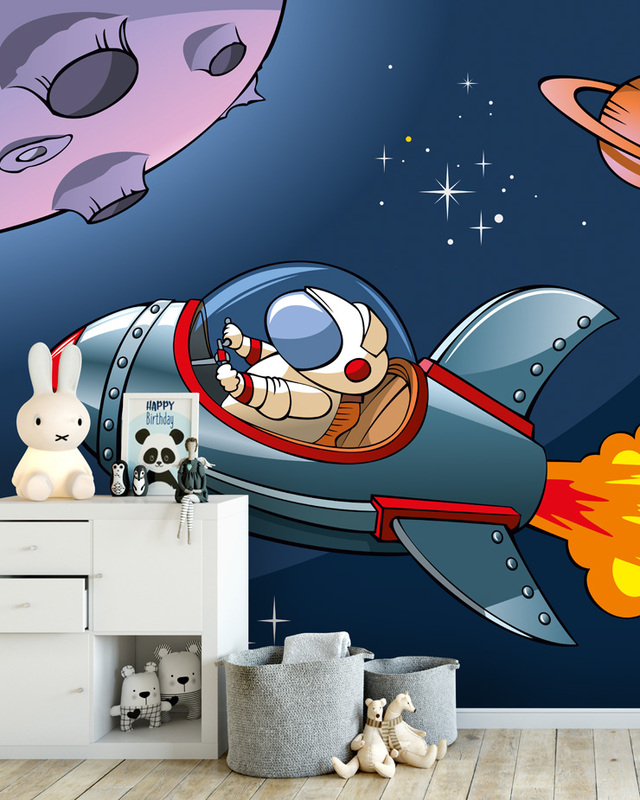 Our retro-inspired kids spaceship mural is completely gender-neutral, and it is suitable for all ages. From when they’re gazing into outer space in their cot to when they’re making their own rockets out of cardboard, this mural will keep them happy for years. Feeling inspired? 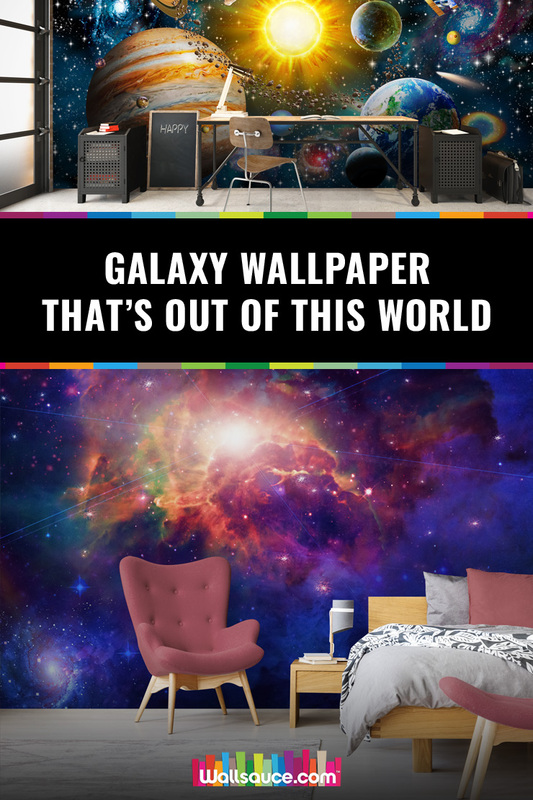 You may also like our blog post on space wallpaper to take your room to another galaxy. Alternatively, see our full range of intergalactic and space themed wallpaper online and feel free to leave any feedback in the comments box below.